Reverse Circulation(RC) drilling is similar to percussion and also employs air through the drill string to the hammer in order to facilitate the drilling action. The difference is that the drill chips passes to the surface through an inner tube within the rod. Once it leaves the drill string it passes through a cyclone which rids the sample of excess dust and impurities. This provides the client with an uncontaminated sample that can be analyzed optimally for purposes of grade control in current mining pits as well as exploration of proposed mining areas. RC drilling is a more cost effective and faster alternative to Diamond Core drilling and also provides versatility in formations that is unstable. Our RC Drill rigs are equipped with hands-free rod-changing mechanisms that reduces the risk of injury in the mining environment. Our rigs are also “Anglo-spec” compliant complete with air conditioned cabs, fire suppression systems, reverse cameras etc. Percussion Drilling employs air pressure through the drill string to a “down-the-hole” hammer mechanism which on its part moves the drill bit up and down for the drilling action. Percussion drilling is the fastest, most cost effective method of drilling water wells, although it is also used in some mining applications where the geological formations do not permit core drilling. Percussion drilling offers the benefit of drilling larger diameter boreholes with minimum complications in the least amount of time. Our drill rigs are capable of drilling to depths in excess of 500meters. We make use of 24bar Compressors. Where necessary additional air booster can be employed to reached desired depths. 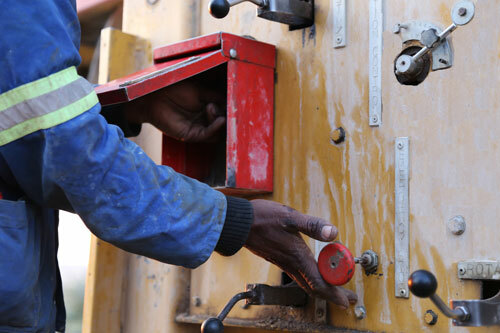 During our 13 years of business, Gobora Drilling has obtained extensive knowledge of the most notoriously difficult drilling areas in the country found in the Northern Cape manganese and iron ore fields. We have the expertise and equipment to drill Red Clay, Pebble Beds and other unstable formations effectively. Mud circulation Drilling does not employ air, but uses drilling mud(which consist of a mixture of chemicals) that gives the “mud” certain characteristics to extract drill chips from the borehole whilst stabilizing the well to prevent collapse. The rotary action of the drill head together with a tri-cone bit “cuts” through the formation and is carried to the surface via the mud. Mud Circulation drilling is used in instances where air percussion drilling is not suitable, for instance where formations are very broken up and the air escapes into pockets within the formation which makes air percussion difficult or impossible. This method of drilling provides a successful alternative to drill difficult formations (i.e. Red clay, Pebble beds, Loose sand) more effectively by drilling in the casing simultaneously with the drill rod strand. Symmetrix (ODEX) drilling is an excellent option when unconsolidated formations are too unstable at risk of collapse. ODEX is a down-hole air hammer system that is designed to advance casing during drilling. Once a desired depth is reached the eccentric bit can be retrieved leaving the casing in place for sampling or installations.